Isabel Hospice Clash Of The Corporates 'Waxathon'! 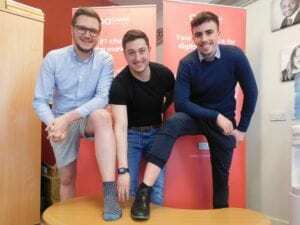 The boys at Cariad Towers have been waxing lyrical about their bravery, as they offered up various body parts for waxing, all in the name of charity. And it all happened on Facebook Live! The lads were all smooth-talked into getting smooth body parts as part of the Isabel Hospice Clash of the Corporates challenge. An initial part of the ‘Waxathon’ challenge had been to raise over £500 in advance, after which they agreed to have their waxes broadcast live to the world. Thanks to donations from supportive family and friends, the target was reached and their Facebook Live appearances were guaranteed. And thanks to the live coverage, an extra £100 was raised before lunchtime! If you’re reading this and feeling a bit guilty you didn’t contribute, there’s still a chance – click here and be generous! The entire event came about thanks to the lovely Marion Adams from holistic therapy centre The Natural Touch. Marion kindly offered to donate her time, expertise and a considerable amount of wax for the cause. The boys were clearly gritting their teeth too tightly during their ordeals, as the lack of screaming was slightly disappointing to anyone watching online (or listening outside the boardroom door). But at least we managed some snaps of classic facial expressions to make up for it. And thanks to their collective bravery, they did themselves proud – there were no red faces… but plenty of red arms, legs, chests and pits after Marion had worked her magic. Things then got even hotter! Whilst Team Cariad loves being generous, we love eating even more! 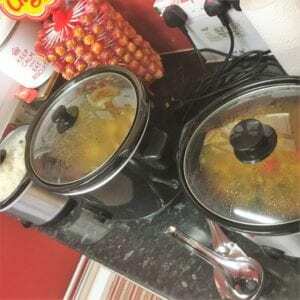 So, to continue the fundraising theme, Sara got busy in the kitchen and came in to work with more slow-cookers than you can shake a stick at, full of delicious chicken and chickpea curries for lunch which she sold for £5 each, raising another £70 for the Hospice. The Great Cariad Waxathon was arranged as part of Isabel Hospice’s Clash of the Corporates challenge which we’ve thrown ourselves whole-heartedly into. As part of the challenge, we’ve already raised nearly £200 on the sale of cakes in the office alone (you can’t keep a good Cariadian away from a bit of baking for long), and we’re now in the final leg of planning our grand finale, Race Night, which will be held on Saturday 6th May in Hertford. That event promises to be lots of fun and, who knows, you may even go home with more money than you started with! Race Night tickets are still available, so get a group of friends together and book now!